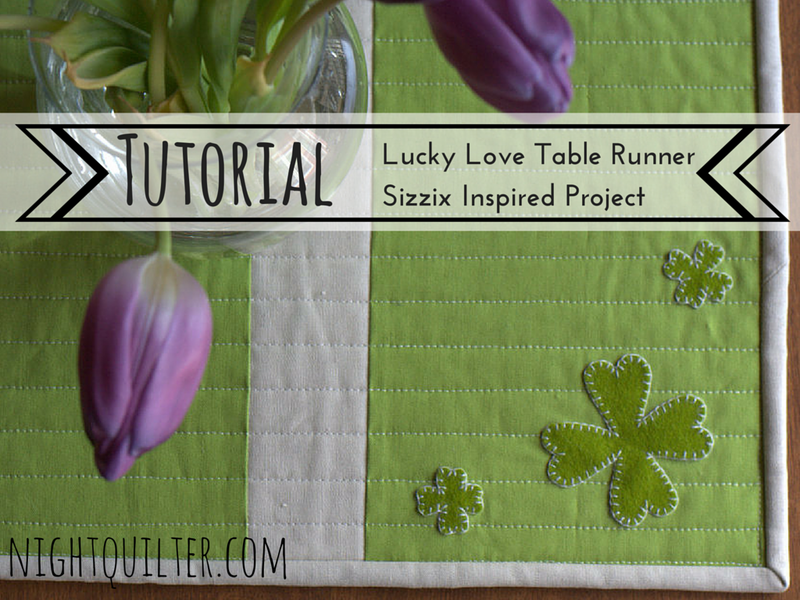 Today I’m excited to be sharing another tutorial on the Sizzix blog, this time for a really sharp-looking table runner (if I do say so myself)! I’m typically not one to make seasonal decor, since the seasons come and go so quickly, but this one is reversible so I can use it all year long. 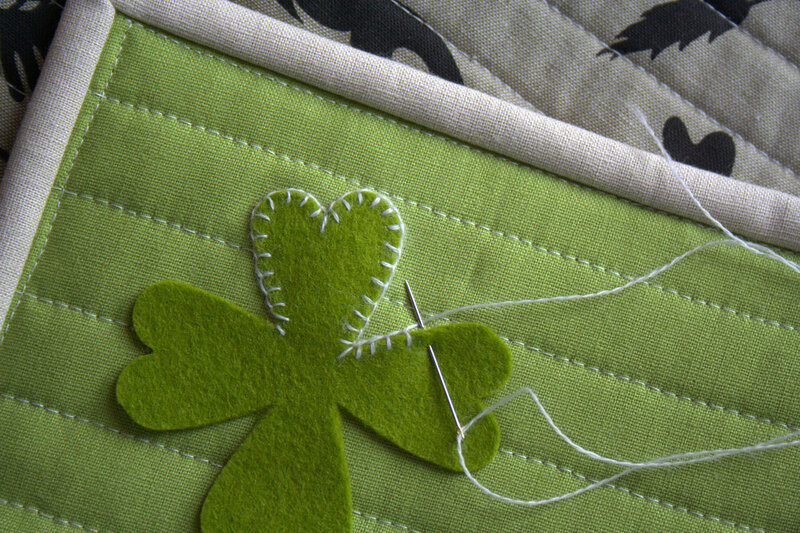 Ever since I first cut wool felt with the Sizzix, I’ve been wanting to do a wool felt applique project, and once I realized I could make four-leaf clovers using my Primitive hearts die, it was game on. I backed the table runner in one of my all time favorite Alison Glass neutrals, Botany in Taupe from Ex Libris, which I certainly won’t mind looking at for the non-St. Patrick’s Day part of the year! Since I love to make the most of the tools I have, this project is also exciting since it’s the third unique project I’ve made using the Primitive hearts #3 die from Sizzix. You may remember my Growing Tree Wall hanging and Valentine’s Day Garland tutorials, the first two projects I made using this die. You know it’s a winner when there seems to be an endless stream of projects that can be made out of a certain tool. I try to make my tutorials helpful to the entire sewing and quilting world, even if you don’t yet have a Sizzix or other die cutting machine, and this one is no different. Head on over to the Sizzix blog to read the full tutorial, and I hope you enjoy! Do you make seasonal projects? How and where do you store them when they are off season? I may need to take some notes if this keeps up! 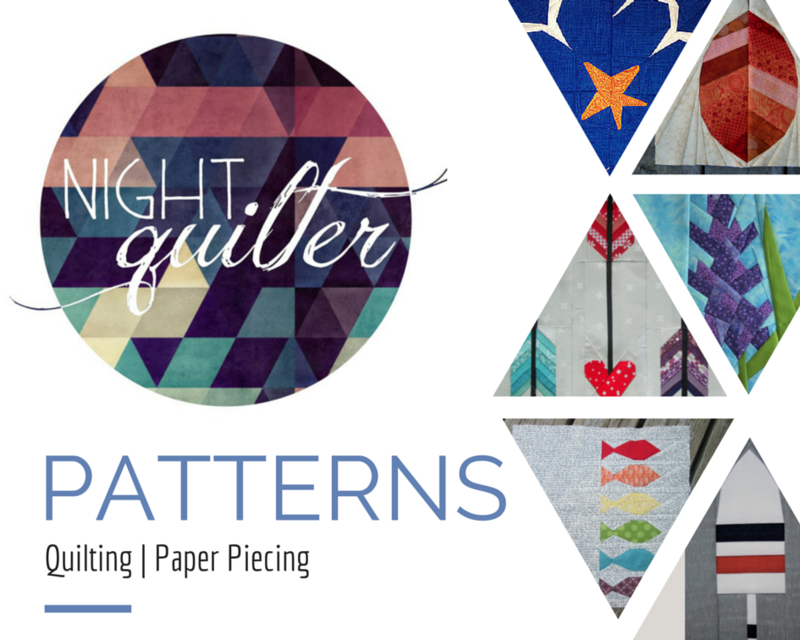 I’m linking up with Tips & Tutorials Tuesday with Stephanie at Late Night Quilter. I completely missed August for A Lovely Year of Finishes (ALYoF), so I’ll just call it summer break. The ALYoF link up is one of the most successful ones at getting me to finally finish projects, though, so I want to be sure to sneak in September’s goal setting post before it’s too late (in other words, before midnight tonight). I’m choosing a quick and easy goal for this month, since there are a lot of behind-the-scenes projects going on, too. 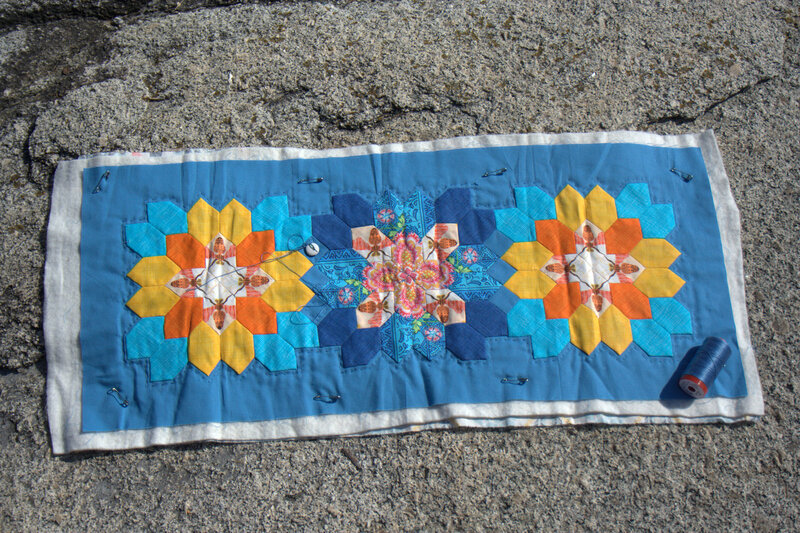 My goal is to finish my Summer EPP Table Runner. 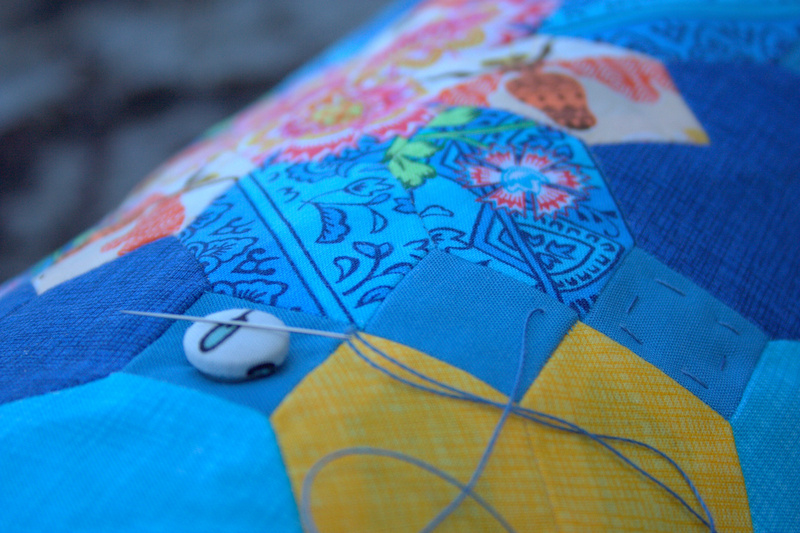 I have a small bit of hand quilting remaining, and then I need to bind it. Easy peasey. We spent a lovely relaxing family day at the beach today, so I decided to have an impromptu photo shoot. I always carry a couple of hand-sewing projects with me, either a small hand quilting project like this one, some English Paper Piecing, or both! The strong cool breeze of the ocean made the 90 degree day feel absolutely perfect, but it made it a bit tricky to photograph this light weight runner. I took a few photos in full sun, which is typically a photography no-no, but with the gorgeous view and glittering water, how could I resist? Then I decided that the trek over to the shady half of the beach was worth it. 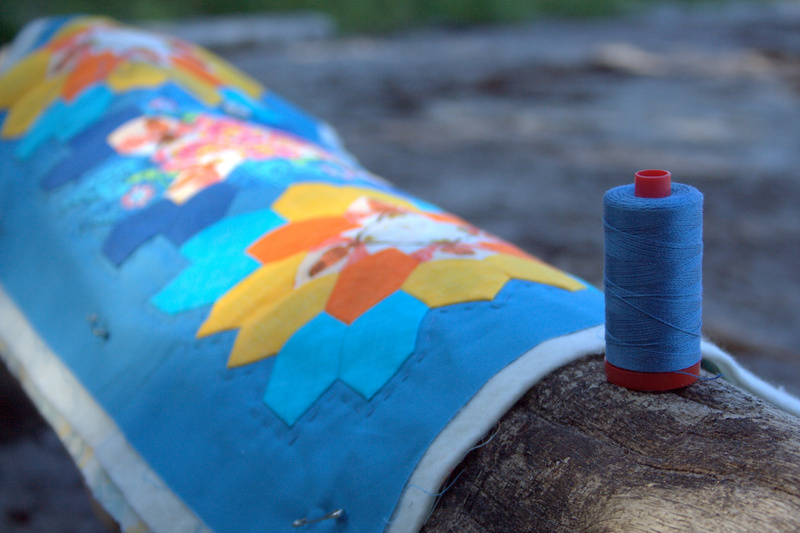 This is just a tiny little lesson in quilt photography. Photographs in full sun result in washed out colors and highly emphasized wrinkles due to resulting shadows (above). 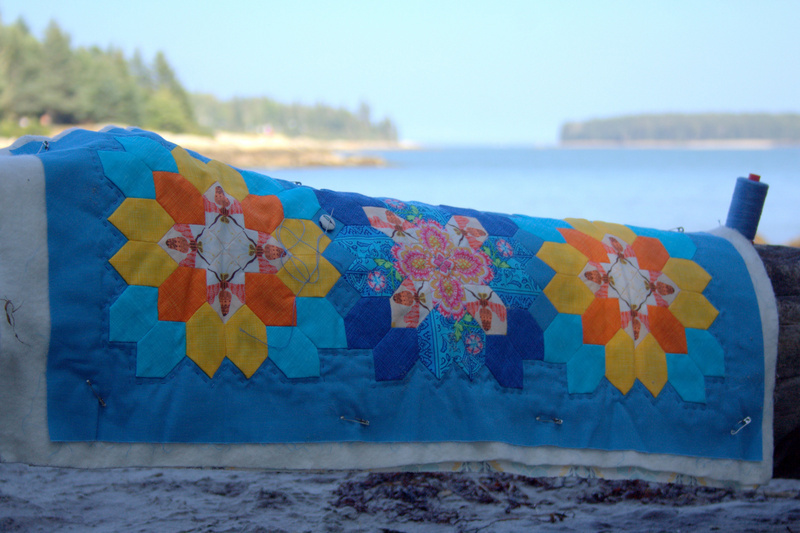 Shady photos, however, provide much richer, truer, and almost more gentle colors and a more forgiving look at the quilt despite the lack of an iron’s smoothing touch (below). 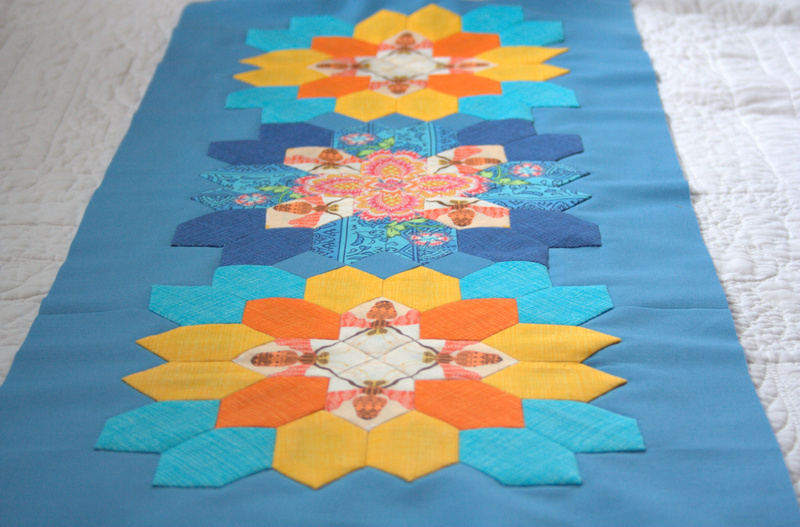 I decided to back this table runner in Bee Sweet in the Morning colorway from Bonnie Christine’s Sweet as Honey fabric line. 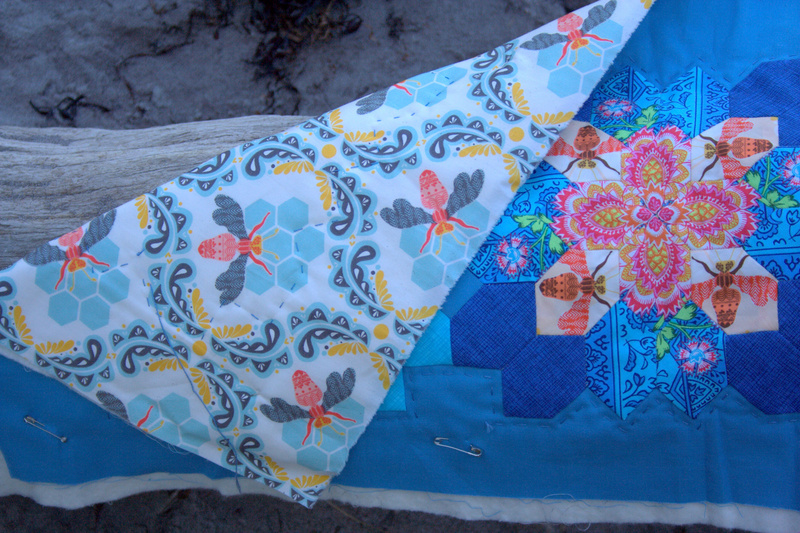 The bees in the table runner top are from the Bee Sweet in the Sunset colorway, so it coordinates fabulously. I have only a bit more hand quilting to do, and then I MIGHT do a little bit of machine quilting to make sure all stays nice and securely despite the many inescapable washes that surely await anything that will live on our table. 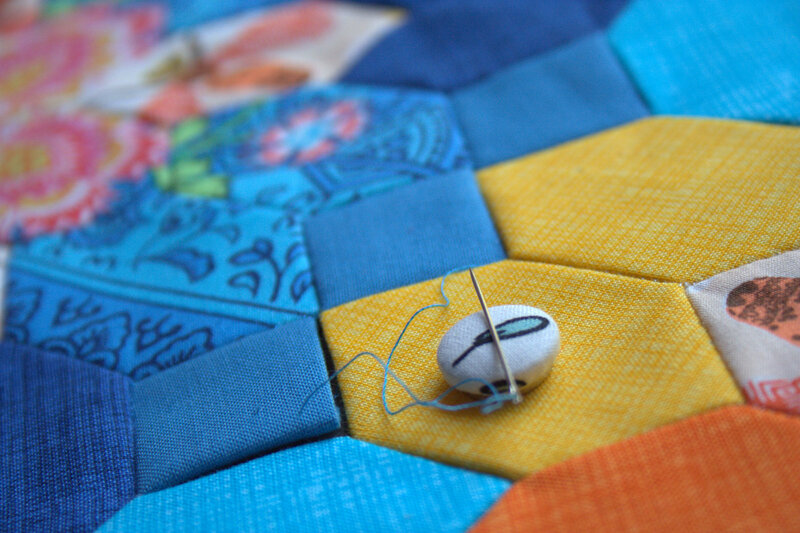 I’m using 12 wt Aurifil thread #4140 Wedgewood, which is a perfect match. I love the subtle effect of the large quilting stitches in a coordinating color, and I’m very much looking forward to having this table runner finished and on our table. It can be a lingering reminder of our fun and beautiful summer. And it WILL be finished by the end of September! I’m linking up with the September Goal Setting Party for ALYoF at Fiber of All Sorts and Sew Bittersweet Designs, then going to bed (with a couple hours to spare). It’s hard to believe that less than a month ago, I was still pregnant. Yet in early June when I was setting my goal for A Lovely Year of Finishes (ALYoF), my goal was to have a baby!! I also added in a little hand stitching goal of completing my Summer English Paper Pieced (EPP) table runner top. I’m happy to report that I accomplished both of those goals! 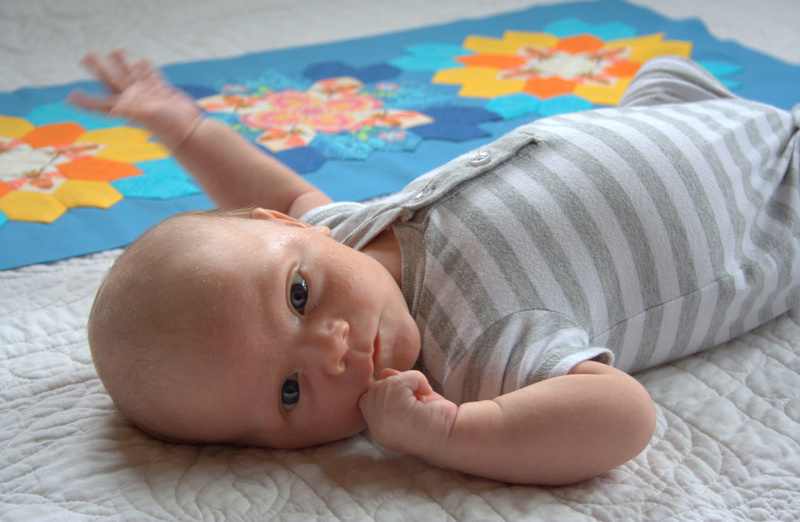 Many of you have been appropriately introduced to baby Finn, who made his appearance 5 days into the month. Earlier today, I completed the final stitches attaching the EPP pieces to a solid border, finishing the table runner quilt top just in time. 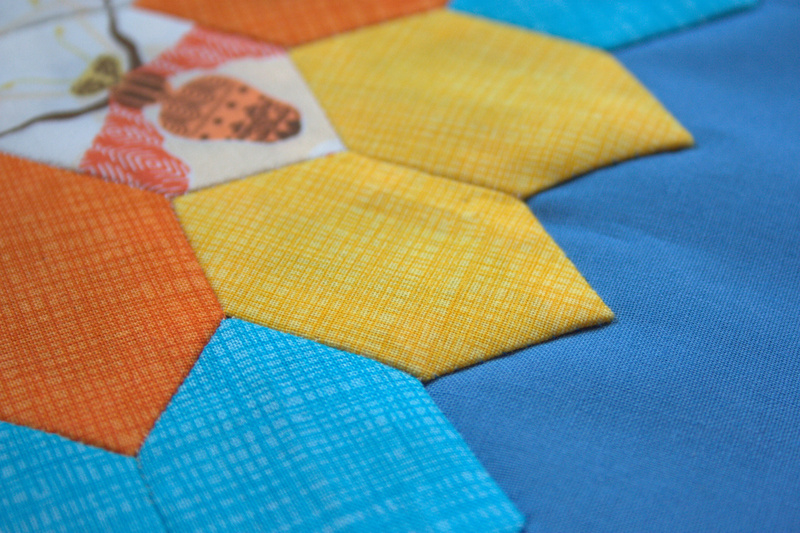 I used blind-ish stitch to sew the Lucy Boston blocks to a solid border fabric. 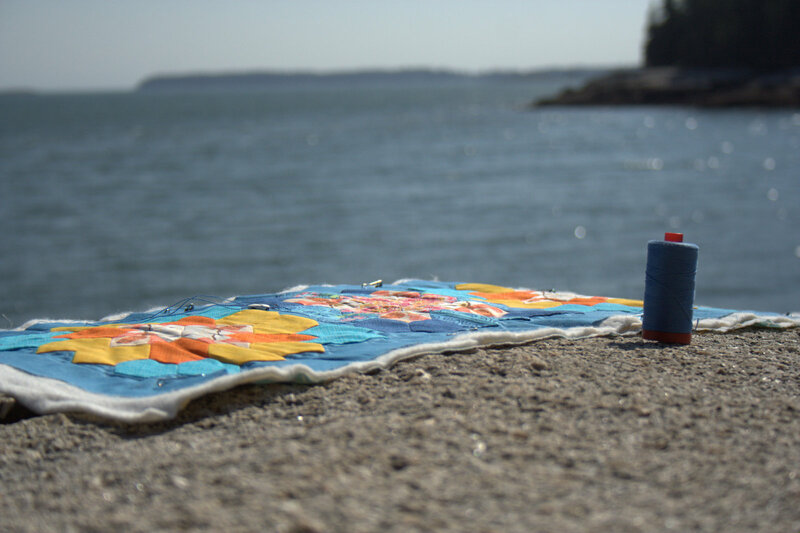 I used Aurifil 1320 – Medium Teal and a blind-ish stitch, which I hear is a highly favored stitch, to attach the EPP Lucy Boston blocks to a solid border fabric, Moda Bella solid in Coastal. I have not yet cut away the fabric behind the blocks, but I most likely will do so before layering, basting, and hand quilting the table runner. Now that I’ve grown my Aurifil 12wt thread stash, I’m excited to hand quilt this table runner. 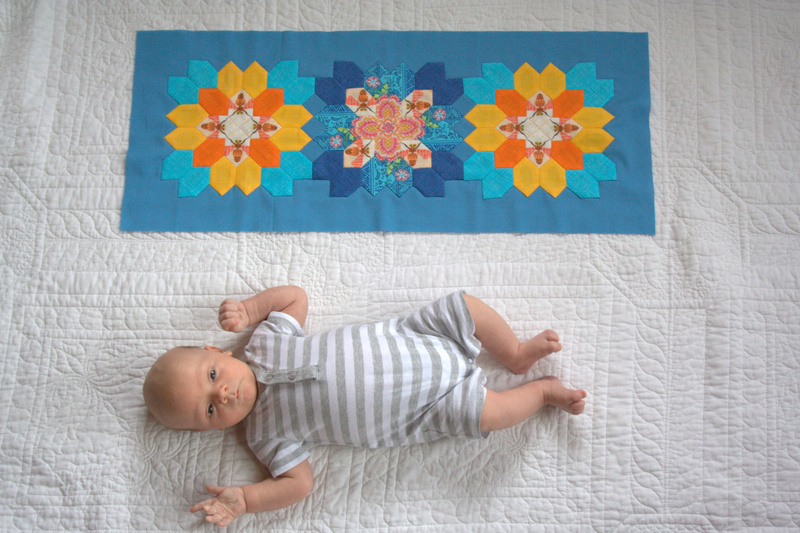 I have not yet decided on a quilting pattern, but I probably will go with a simple echo-border pattern. Finn doesn’t seem too interested in the stitching, but that’s ok! I’m linking up with A Lovely Year of Finishes June Finish Party, and already contemplating my goal for July. I’m really enjoying being a part of ALYoF, since it is a little added incentive to focus on one project and actually make visible progress. This is my fourth successful monthly finish, since I missed the goal setting deadline for January and completely missed May. Not too bad! The fussy cutting fun involved with English Paper piecing (EPP) and Lucy Boston Patchwork of the Crosses blocks hooked me immediately (although I still think it should be called meticulous cutting or assiduous cutting). I’m still wondering what one is to do with these gorgeous blocks other than make a ton and stitch them into a large quilt, though. 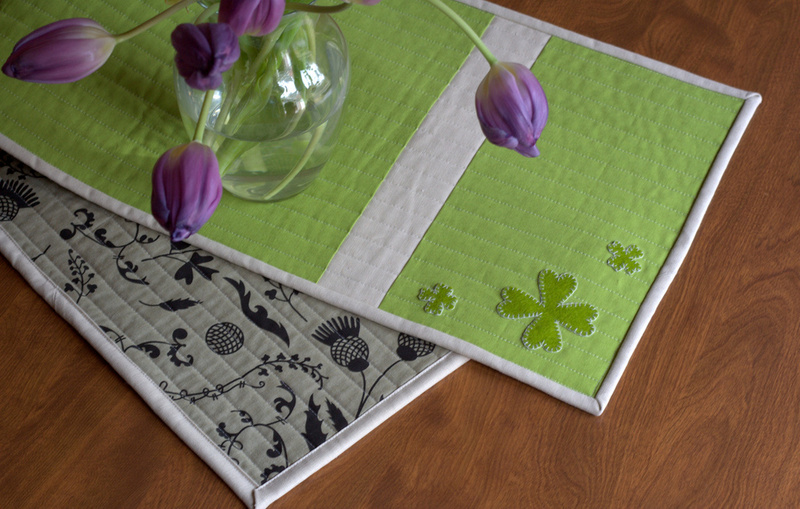 With the three I’ve completed, I decided to turn them into a summery table runner to match these placemats. 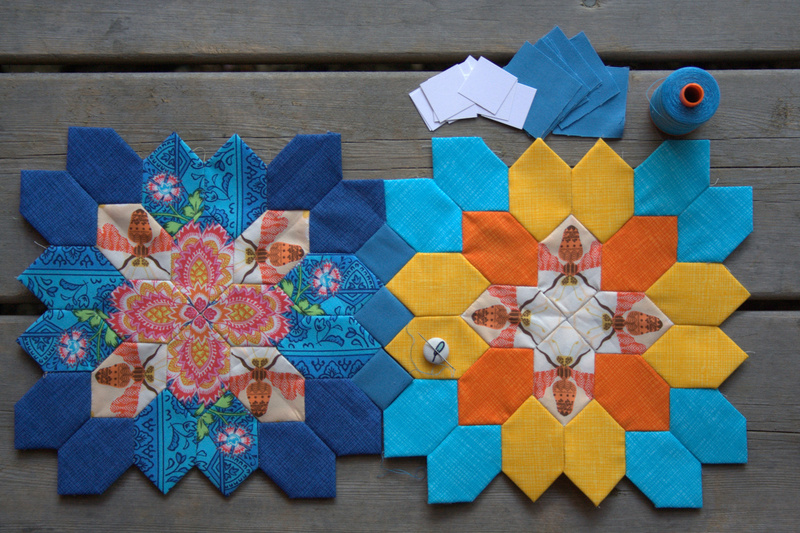 I’ve begun to join them together, slowly planning how I want to border these blocks so that they finish as a table runner. This is my first time “finishing” an EPP project, so I’m learning as I go (read: making it up as I go), as I do with most everything. 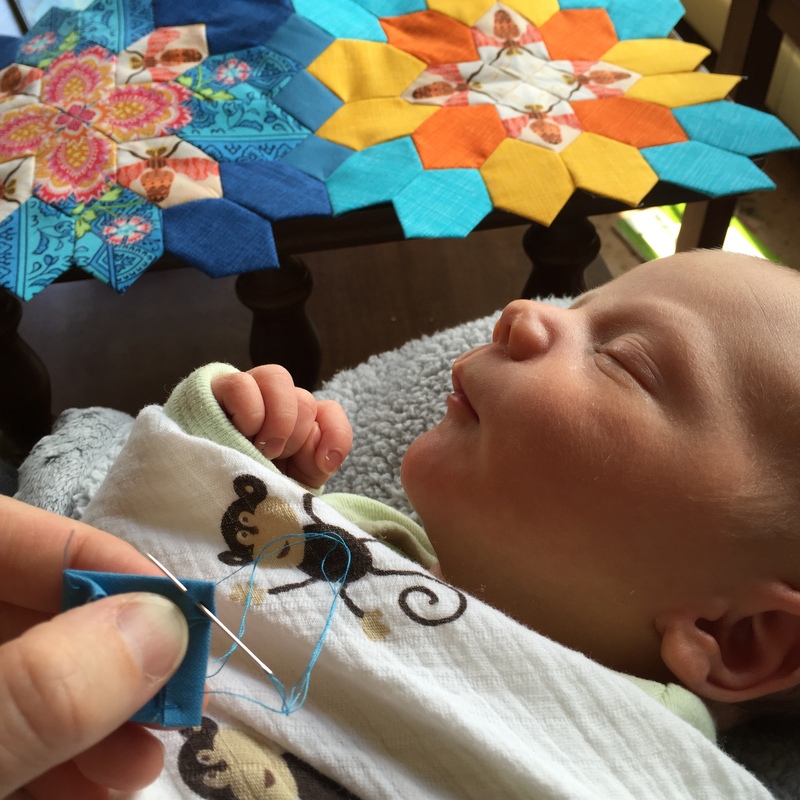 With a newborn snoozing in my lap all day and night, and since I still have the help of my visiting mom and paternity-leave-taking husband, I’ve been making steady progress on finishing the center block and making tiny 1″ squares to join the three together. Even since these photos were taken this morning, the third block is joined as well. There’s not much better than resting with a peacefully sleeping newborn on your lap, doing some stitching while watching the milk drunk stupor reflex smiles. My view earlier today, shared on Instagram. I’m loving the teeny tiny needle minder gifted to me by Mara of @mara_makes on IG. Since I made my own 1″ square EPP templates with card stock and my paper-cutting rotary cutter, I’m thinking I may just make my own templates for the entire border. In plotting it out, a combination of squares, rectangles, and trapezoids should do the trick (I think). 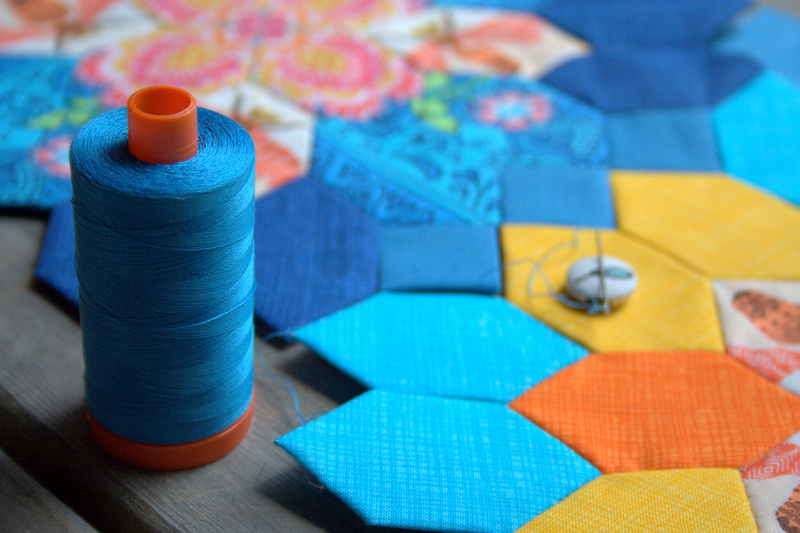 Have you joined Lucy Boston Patchwork of the Crosses blocks before? What method/shapes did you use? Please link in the comments if there’s a particular method you like, even if it’s just a general EPP tip! I honestly haven’t asked google yet, but I prefer to hear opinions from you, anyway. 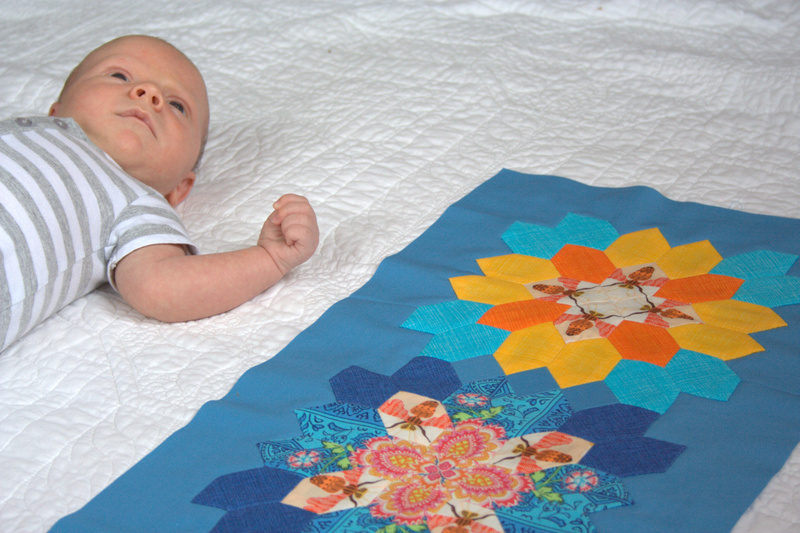 What do you make out of your EPP creations? I am really itching to do some more fussy cutting, but I need to have a project idea in mind before adding another project to my pile. I’m linking up with Freshly Pieced’s Work in Progress Wednesday, and then switching my gaze back to the beauty asleep in my lap. Happy stitching!